In a previous material we have presented the results of studies of birds of prey during the automobile trip to Orenburg for the 13th international ornithological conference. On the way back the route of our travel was changed. Observation results for birds of prey during the car expedition from Orenburg (Russia) to Luhansk (Ukraine) are presented below. 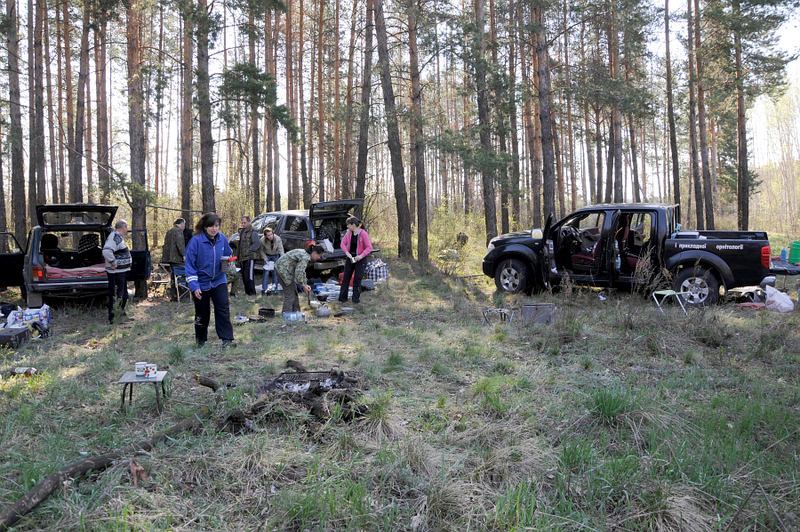 On the 4th May 2010, immediately after the conference, we left the hospitable Orenburg City and in the evening already reached a famous Buzuluk Forest (Orenburg region) where camped for the night. In the surrounding area we discovered an adult Imperial Eagle which is not unusual since the forest is known as a habitat for this species. Next morning, 5th May 2010, our team split into two groups, and afterwards went by different routes. One group composed of V. Milobog, E.M Pisanets, V. Remenny and A.Rashelevskaya, intended to reach the Ciscaucasia as fast as possible to conduct the foreseen herpetological and ornithological observations. The main purpose ofanother group including V.P. Belik, V.V. Vetrov, M.N. Gavrilyuk, E.V. Guguev, S.P. Litvinenko, A.B. Chaplygina, G.A. Yevtushenko and N.I. Konoplya was the ornithological survey in steppe areas of Volgograd and Astrakhan Regions. Below there are results of these particular observations. 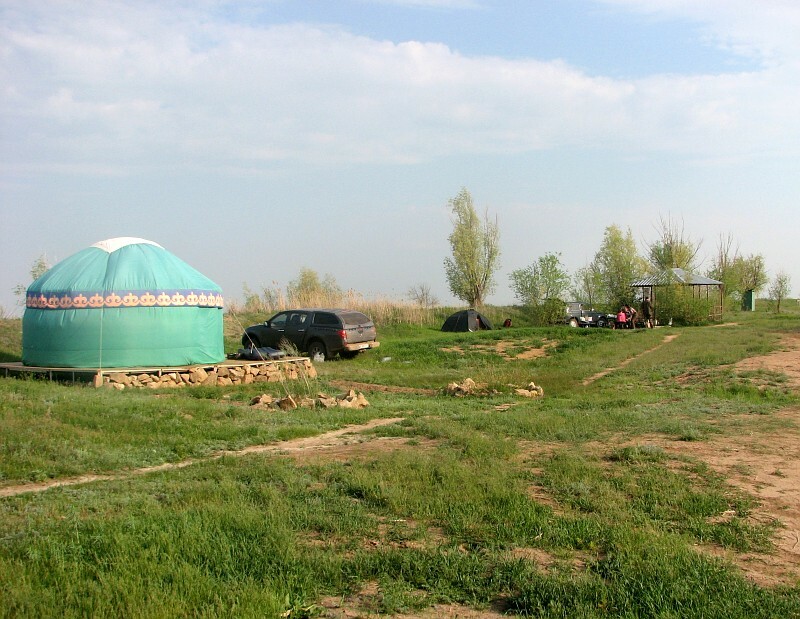 During the 5th of May we crossed the remained part of Orenburg Region, then the south-east of Samara region and by the evening entered the region of Saratov, making our next camping in a copse at the bank of the steppe river Bolshoy Irgiz. Only on the 6th of May we finally got to Volgograd Region and had lunch on a bank of the Eruslan River among old pine plantations on sandy terrain. The same as on the way to Orenburg, this part of our travel we moved mostly by earth roads, spending a lot of time to find them among the endless fields. 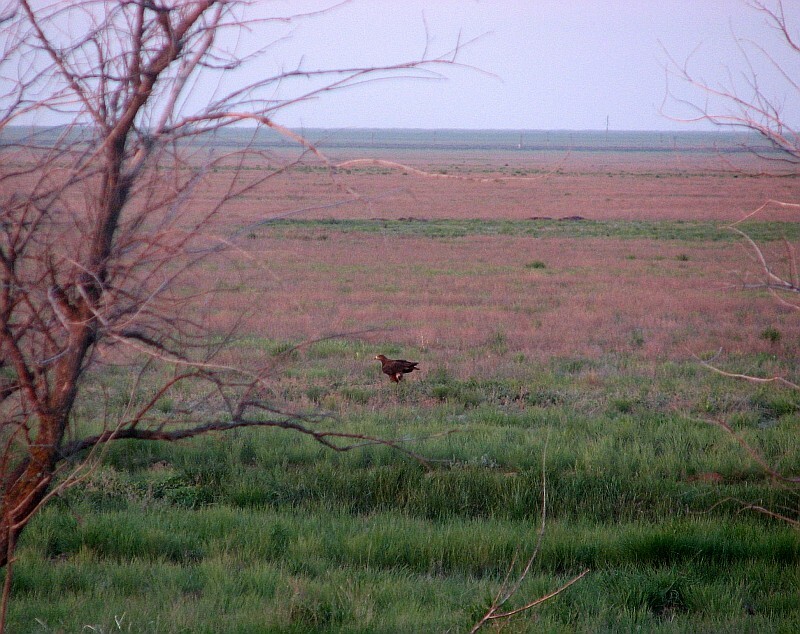 Near the border of Saratov and Volgograd Regions we had met the first Long-legged Buzzard. However, a total number of birds of prey was low. Within the stretch of 655 km (to the border of Volgograd region), there were recorded 2.11 ind/10 km of Falconiformes. Dominated species was the Montagu’s Harrier (in one place it was found a group colony of 8-10 pairs), common species were the Black Kite, Marsh Harrier and Common Kestrel. A total 9 species of Falconiformes were recorded: the Black Kite – 4 pairs and 15 single individuals, Montagu’s Harrier – 16 pairs and 10 ind., Marsh Harrier – 2 pairs and 15 ind., Sparrowhawk – 4 ind., Common Buzzard – 6 ind., Booted Eagle – 1, Imperial Eagle – 1 nest in the forest belt in Samara region and 1 single bird, Common Kestrel – 5 pairs and 24 ind., Red-footed Falcon – a pair and 4 ind. 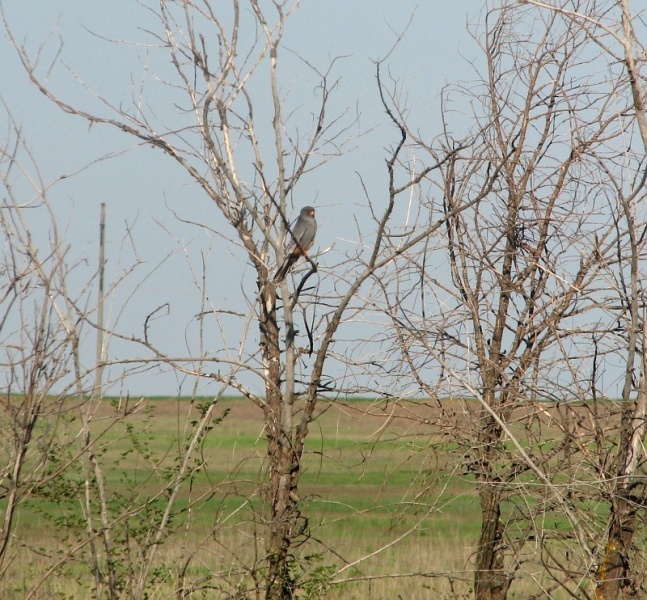 On the road further south, in the Volgograd Transvolga area, the number of Red-footed Falcons began rapidly growing, which was associated with increasing areas of the virgin steppe. However the most interesting records were still awaiting for us. Having passed the village of Pallasovka, which got its name after a famous Russian zoologist and traveller P.S. Pallas, we saw that frequency of birds of prey observations had risen sharply. The first on our way was a nest of the Imperial Eagle, located on a small tree in a group of planted trees, growing along the asphalt road. A bit later we saw a Long-legged Buzzard’s nest, then that of the Steppe Eagle, and after that everything mixed: eyries of birds of prey were met every kilometer. Within 49 kilometres it was found one occupied nest of the Imperial Eagle, 6 nests of Steppe Eagles, 15 of the Long-legged Buzzard’s and also met three single Steppe Eagles. And this is despite the fact that they have been identified along the asphalt road, i.e. we saw them from the car not stopping and going out for a special observation. A high number of raptors in this place is explained by the fact that there the road crosses a vast area of steppe lands, almost deprived of trees. Therefore the only safe nesting place is a forest belt along the highway. This evening we stopped for the night in the national park ‘Prieltonsky’ and had a chance to sleep at the shore of Chapaevsky Pond in an equipped Kazakh yurt. During the morning walk on the 7th May in the surrounding area we have found an occupied nest of the Imperial Eagle on a solitary poplar in the gully as well as traces of the Eagle Owl. The main purpose for that day was a survey of Prieltonsky steppes. But at first we used the opportunity to look at one of the saltiest lakes in the world – Lake Elton. Ornithological surprises were ahead. On a slope of the gully that went to the lake, we found three nests of the Steppe Eagle. 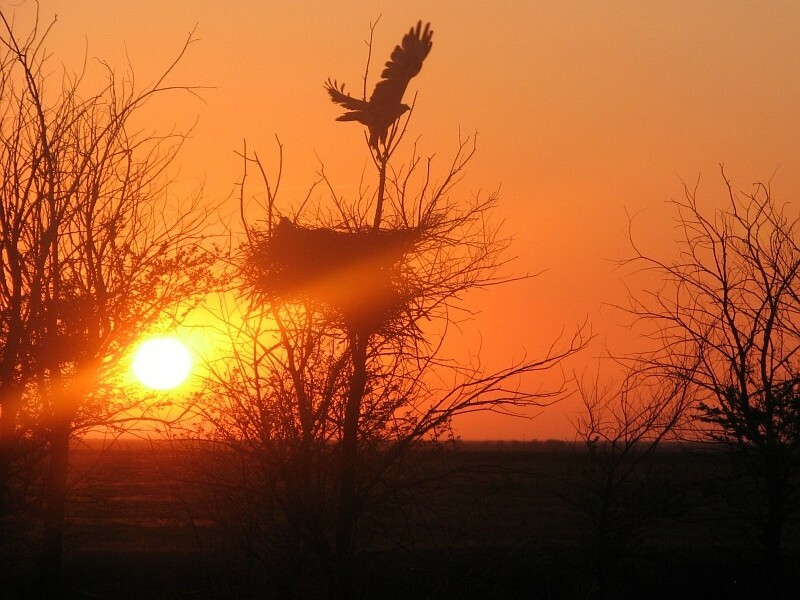 Two old nests were located on small bushes, and the occupied one with a clutch of 3 eggs was on a pear-tree at the height of 3 m. Going further into the steppe, we scared off a male of the Long-legged Buzzard, roosting on a small cliff of the steppe river. Judging from the droppings, the bird stayed there permanently, so its nest must be located not afar. Can you imagine our surprise when we found it quite close, directly on ground at the ledge of a small cliff. According to a pattern of its location, it was more similar to nests of the Rough-legged Buzzards in tundra. There were 2 eggs and two downy chicks and the remains of prey. Following on, we noticed a tyre of the truck abandoned near the steppe road. In the middle it was filled with the horse dung since Steppe Eagles began making a nest in it. Our meetings with Steppe Eagles during the day were regular. In one place near a small freshwater reservoir, located in the lowering, we scared off about 30 of these birds (mostly immatures), gathered there for roosting and watering. 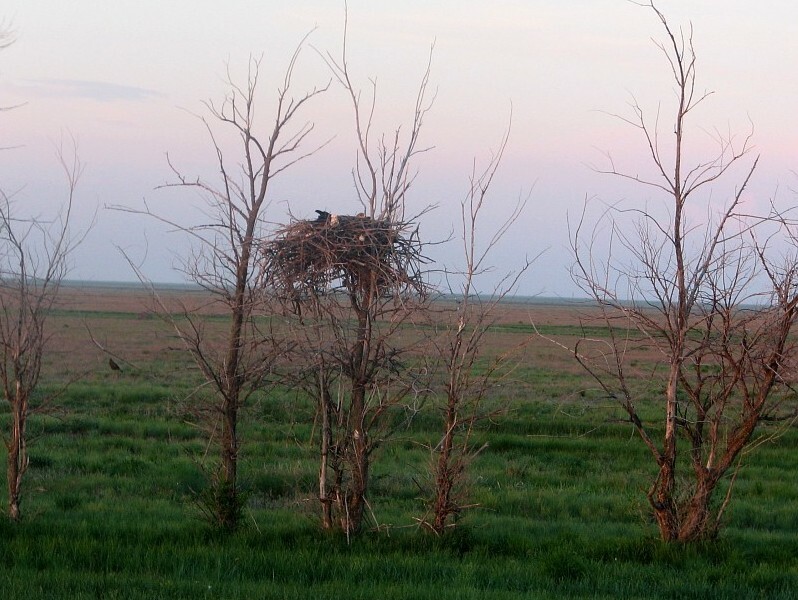 Finds of occupied nests of Steppe Eagles also didn’t keep us waiting. Genuine interest was aroused by two ground nests near the earth road. The females incubating their clutches allowed our car to approach only for a few meters. The most impressive feature of Prieltonsky steppes is their vast area: in some places you might not see a single tree, not a single building or a single person to the horizon around you. 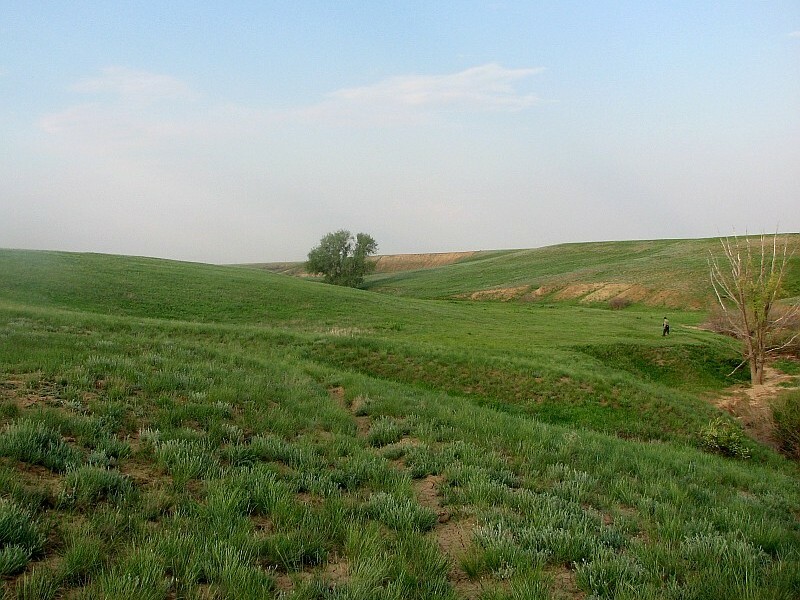 Some planting indicated on the map as a “garden” may actually mean only a few trees among the bare steppe. In all these places the Long-legged Buzzard nests. We found the nests of 4 pairs of these raptors located in trees. One of the pairs nested right in a small village. But the most surprising was to find two occupied nests of the Long-legged Buzzard built on a plain ground. Such breeding cases were for the first time discovered in this region by a birdwatcher, Valery Pimenov (Volgograd), and presented at the 13th International Ornithological Conference of Northern Eurasia (Pimenov, Belik, 2009). From other Falconiformes in the steppe we managed to observe one transit Levant Sparrowhawk and another bird at the pond. 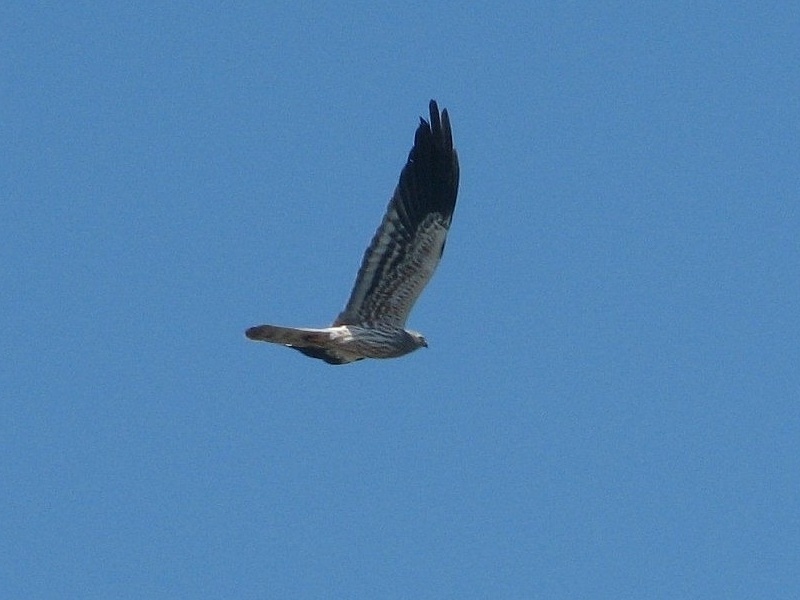 A hawk in the lower reaches of the Khara River at Lake Elton, a female of the Montagu’s Harrier in the morning at the pond, 1 female and 1 male – in the desert, 3-5 pairs of the Marsh Harrier at Chapaevsky Pond, and 1 in the lower reaches of the Khara. Unfortunately, our research of Prieltonsky steppes was ‘speeded up’ by a sudden and powerful rainstorm unexpectedly moved from the east and followed by a dust storm which either didn’t promise us any good. As a result we had to withdraw quickly toward the Volga. 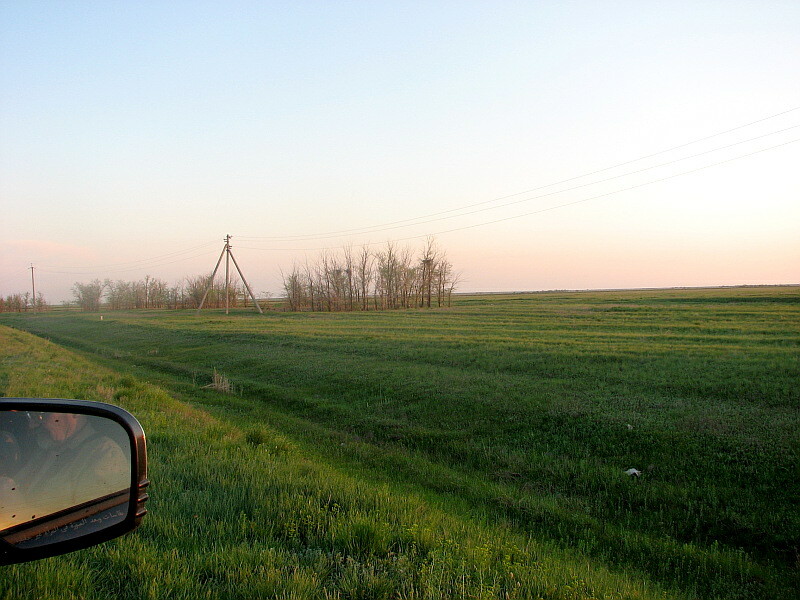 A short trip by asphalt road – and we’ve found ourselves in Astrakhan Region. Along the highway we revealed two occupied nests of the Long-legged Buzzards, made in forest belts, and encountered one more bird of this species. We stopped for the night among sands in a semi-desert, not far from Lake Baskunchak. During a morning walk, 8th May, among undulate sandy terrain in a forest belt it was discovered an occupied nest of the Long-legged Buzzard with a clutch of three eggs, and then seen another pair of these birds. The vicinity of our camp supported breeding of 5 pairs of Red-footed Falcons and 2 pairs of Common Kestrels. 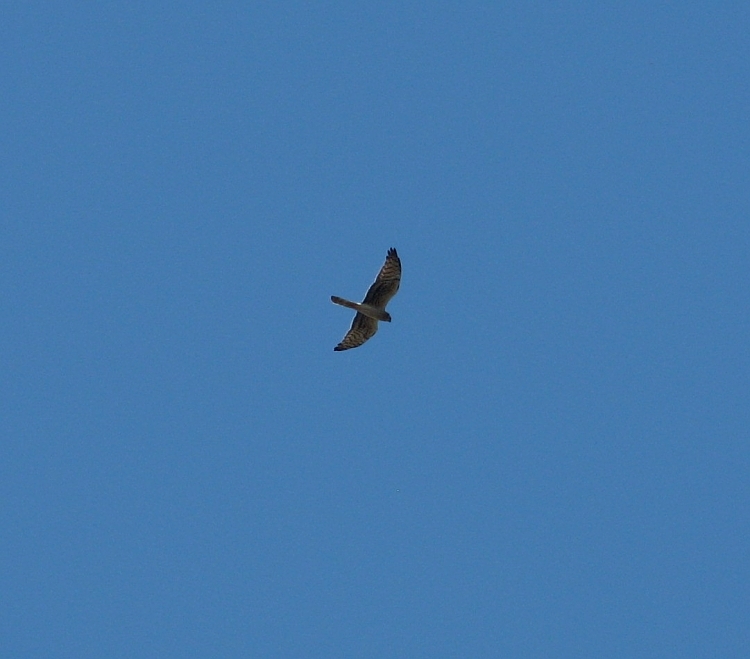 In forest belts it struck the eye a high number of migratory insect-eating passerines bustled about in the bushes, and among migratory raptors a Honey Buzzard was recorded. As for other interesting birds we heard a Stone Curlew in the night and saw a Little Bustard in the morning. Having packed our camp we soon reached another salt lake called Baskunchak. 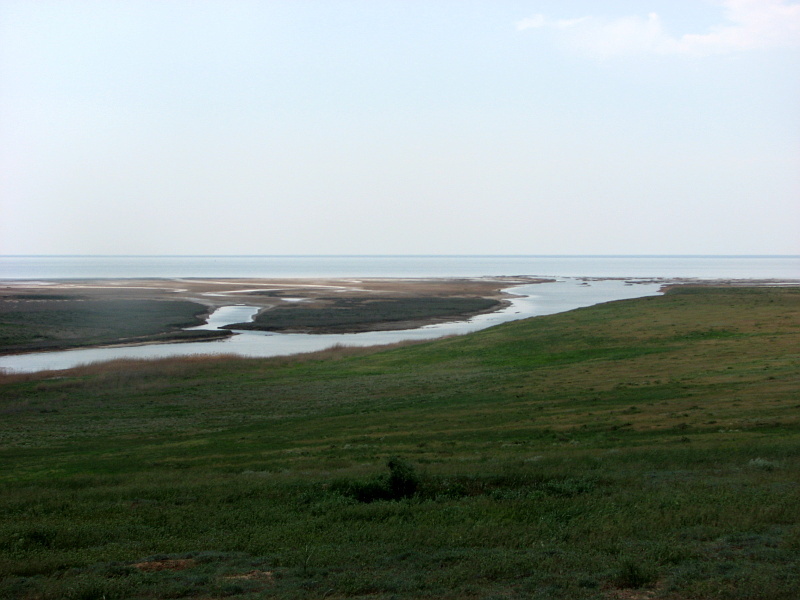 It is situated in the territory of Bogdinsko-Baskunchaksky Reserve with this salt lake as the main place of interest. And there we have one more chance to convince that it’s a small word and the ornithological ‘brotherhood’ is strong. The guards at the entrance of the reserve strongly objected to pass us into the territory by our own cars. ‘It’s only by permission of our Deputy Scientific Director…’ they answered us lazily. Then a car arrived, and the Deputy Scientific Director went out. Our optimism raised – he was an ornithologist, Mr. Amosov, whom we met at the Orenburg conference just a week ago! In the reserve area at the southern shore of Lake Baskunchak as a lonely high hill raised so-called ‘a salt dome’ – Bolshoe Bordo Mountain, on powerful rock ledges of it we have found two unused nests of the Long-legged Buzzard. According to Mr. Amosov they bred there only a few yeas ago. Two occupied nests of these raptors we found not far away, on poles of the power line. 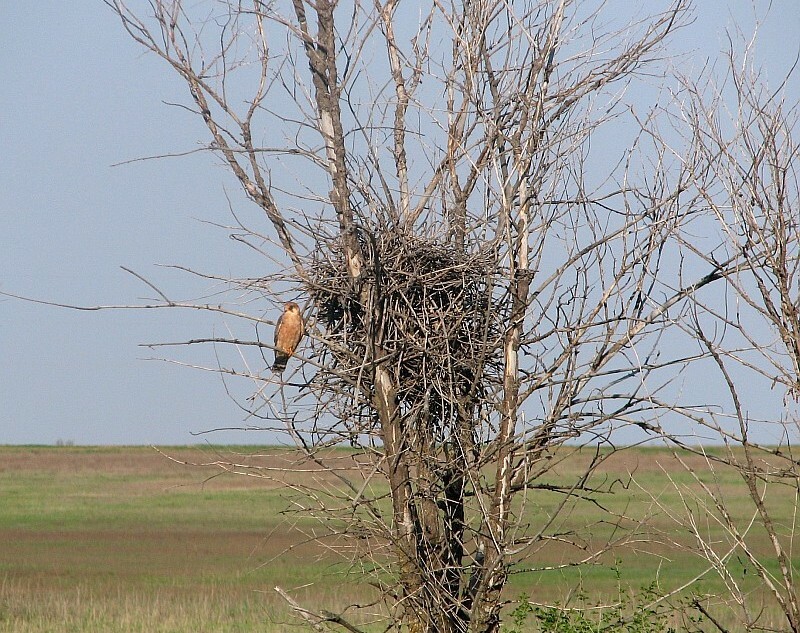 Another nest of the Long-legged Buzzard could be seen on a tree close to the lake. These places also gave us an opportunity to see a migratory Levant Sparrowhawk and a juvenile Imperial Eagle. Having ‘bathed’ in the salt lake, from which the salt is extracted directly into wagons, we set out to the town of Volzhsky (Volgograd Region). There, after a hospitable ‘home welcome’ the rows of our expedition thinned out since a part of Russian colleagues had to stay at home. Early in the morning of the 9th May we drove through the festive Volgograd, preparing to commemorate the Victory Day of the World War II. Riding along the highway we continued counting birds of prey though their numbers among biotopes with the dominance of agrolandscapes were small. On the 377th km of the route we saw 12 species of Falconifromes with an average number of 1.29 ind/10 km. The Red-footed Falcon prevailed. As for interesting encounters it should be noted an occupied nest of the Imperial Eagle on a poplar next to the highway, and also a migratory Levant Sparrowhawk. After crossing Rostov Region through villages Oblivskaya, Bokovskaya and the town of Millerovo by the evening we had reached Luhansk, our starting point for this tour which finally covered more than 4,000 km. In the same course of time our second team transited the regions of Samara, Saratov, Volgograd and Astrakhan, crossed Kalmykia Republic and after that approached Daghestan. There zoologists spent for three days. Among rare Falconiformes they saw the Black, Griffon, Egyptian and Bearded Vultures. Their way back went across Stavropol Territory where they discovered two occupied nests of the Imperial Eagle. Thus, a total of 6 nests of the Imperial Eagle was found by us during the three expeditions in Stavropol steppes in 2008-09-2010, though in the past only three findings of these nests were known for the area and recently it was even considered that the species is vanishing. From Stavropol our zoologists entered Karachai-Cherkess Republic, staying there for one day. After a lot of road hardship the second group arrived to Luhansk only in the evening of the 10th May.